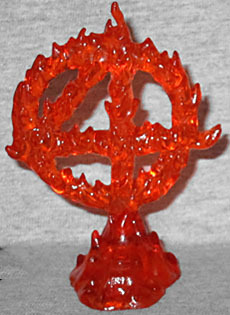 Yes, that's the same bio "Flame On" Human Torch had, so it doesn't tell us anything about why he's called Nova Flame HT. Johnny uses the term "nova blast" to refer to his maximum heat output, most often released in an omnidirectional wave around him - a giant expanding fireball, in other words. 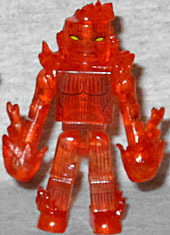 This figure is just a normal looking Human Torch, trans orange with black vertical lines painted on him, though he does get the fancy new "fire" feet and a new piece that covers both his shoulders and his head in flames. Oh, also the same energy balls Silver Surfer had. What really makes this an interesting release, however, is his base. It's a two-piece conglomeration that features a single footpeg, allowing him to stand/hover in front of a flaming 4 in a circle - the Fantastic Four's emergency signal. It's nicely designed, and not something we've ever seen before. It would be nice if it could be raised up a little higher, since it's mostly obscured when the figure is on the footpeg. The ruler of the Negative Zone, the insectoid tyrant called Annihilus is always seeking to conquer new lands and is endlessly reincarnated through his offspring. He was recently re-elected. Re-elected? The Negative Zone has elections? Do the alien bug monsters have to show their ID to prevent alien bug monster voter fraud? Probably not: that would be a ridiculous idea! 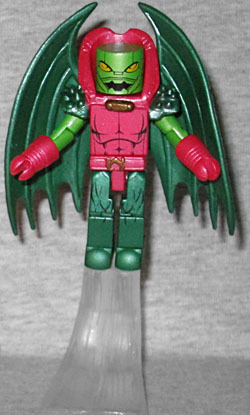 Annihilus has a very distinctive look that this Minimate handles nicely. The collar and spiked shoulder pads are one piece, with pegs on the back for his wings to attach. His belt is new, but other than the sculpted gloves, all his costume details are painted on. His face looks both robotic and insectoid, like it should, and his pink-and-green colorscheme is terrific. It's not at all washed out like Hasbro's was. The set includes two disc bases, but also a flight stand for Anni. Marvel Minimates TRU Series 15 is another series where all the figures were exclusives, but only half of them were marked, which is frustrating. On the other hand, all the sets were also intended to complete or complement existing releases, which is fun: clearly, Nova Flame Human Torch and Annihilus go along with the FF-themed Series 48.